Maldivian islands are world-known for being the ultimate luxury beach escape. Their sandy shores provide an idyllic place to spend lazy days splashing around in turquoise lagoons, or kicking-back in ocean-front hammocks. Yoga and art classes, scuba diving excursions and water sports activities are all popular daytime activities. Yet, you may be wondering what is there to do in the Maldives at night? This beautiful collection of islands aren’t particularly famed for their nightlife, yet there are a host of activities that will help to keep you entertained after sundown. From romantic sit-down dinners on your own private island to open-air cinemas, we reveal seven things that you can do in the Maldives at night. Many of the ultra-luxurious Maldives resorts own uninhabited sister islands which they use for romantic, private dinners. One popular excursion is where you will be whisked on a private boat to your island where you will find a candlelit dinner filled with all sorts of delicious local delicacies, along with the best bubbly just waiting to be enjoyed. The boat will depart, drop you off and come back for a pick-up later on so you can enjoy the island to yourselves. For group dinners, a personal butler may be on hand to keep the drinks coming. Other resorts offer private sandbank or starlight dinners nestled away in a quiet spot on the island. If your resort offers a private dinner experience, it’s certainly worth shelling out the extra cash to go for this option. It may be an expensive add-on, but it is more than worth it for the memories. Not all resorts own extra private islands, but some may be able to do other setups, like a private picnic in one of the more remote areas of the island. For a true private island experience, book a stay at the W Maldives – Click here to see more photos of the stunning resort. This resort has its own private island called Gaathafushi which is just five minutes away by speedboat. Guests can enjoy an exclusive private dinner on the powdery sands of this island. Private dinners start at $800 for a couple and include the speedboat and all drinks and food. 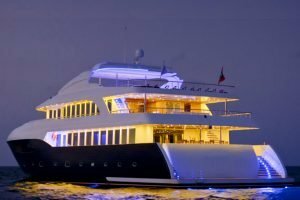 Other dining options offered here include dinner on the W’s private yacht aptly called Escape, a private dinner in fire beach (surrounding by huge burning tiki torches), as well as an in-retreat private BBQ or candlelit dinner set-up for you in your own villa. Another gem in the private island dinner world is Maafushivaru. They offer a signature Lonubo dinner which they describe as the crème de la crème of romantic experiences. The dinner is set on a private island away from the main resort, where a personal chef and waiter are on hand to serve up local dishes, and dazzling drinks before leaving you to enjoy the magical location alone. Other options here include a four-course candlelit dinner on a secluded part of the beach as well as a five-course lobster dinner just steps away from the Indian Ocean. Click here to see photos and book Maafushivaru Resort. Reethi Rah have mastered the art of a luxury sandbank dinner. The experience includes a beautiful beachfront setup complete with fresh flowers, glowing lanterns, and exquisite tableware. A personal chef is there to delight you with delectable canopies and a personalized meal that caters to your tastes and dietary requirements. The dishes will be paired with fine wines and champagne, or fresh handcrafted juices and mocktails. A must for couples seeking a little romantic hideaway at night. Click here to see photos and the current rates for One and Only Reethi Rah. 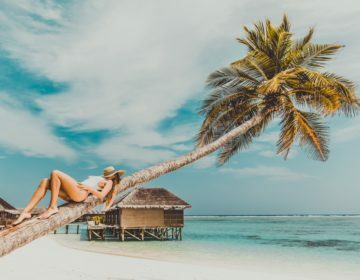 While many people who visit the Maldives chose to stay in their resort for the duration of their trip, venturing out into Male Island, or another nearby local island can prove to be a beautiful culture experience. These excursions really allow you to view another side of the Maldives, and glimpse into the lives of locals. Male Island is one of the most densely populated islands in the world. 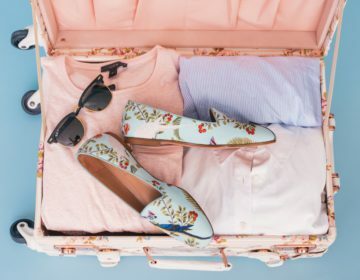 There are a myriad of activities to choose from here, including visiting stunning mosques, exploring national museums, boat trips, water activities and more. If you’re visiting Male then we definitely recommend staying in a hotel for the night so that you have time to take in a little of the local culture. If your international flight arrives after dark, then you will have to stay on the island for a night anyway as seaplanes can only fly during daylight hours. So why not make the most of your vacation by choosing some locals tours and excursions to participate in? On of our favorite hotels in the main island is Hulhule island Hotel – click here to see the current rates. Do you remember that scene in ‘The Beach’ where they go swimming and the ocean glows with tiny blue specks of light? That happens in some parts of the Maldives, and it is one of the most incredible sights that you can see. The fairytale effect happens because ostracod crustaceans gather in certain parts of the Maldives and create a magical glow-in-the-dark effect when disturbed by the movement of the waves. Often mistaken for bioluminescent plankton that light up for only a second or two, ostracod crustaceans can actually ‘glow’ for up to a minute, lighting up the sea like a thousand shimmering stars in the ocean. This effect is a bit of a rare sighting though and only happens at certain times of the year. The high season for plankton spotting is between mid-summer to winter months, although they have been spotted in various locations year-round. Some recent sighting includes at Kuredu Resort in November, October at at Reethi Rah between August and September. Another resort favorite is an open-air cinema. It is becoming incredibly popular for resorts to offer these screenings after sunset, once or twice a week. Classic films are played while you relax on bean bags and sip on fresh juices or cocktails. Some will also offer private open-air cinema screenings where they will set up a private hideaway for two. 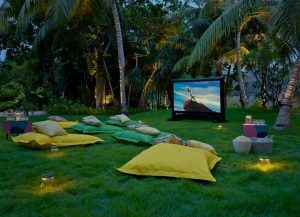 One of the best places to experience open-air cinema is at the Jungle cinema at Gili Lankanfushi. This ultra-lux resort is most famous for its thatched-water villas, but another highlight has to be the design and location of the cinema. They’ve created a beautiful space located in the lush jungle, where you can lounge on comfy chairs and have friendly staff bring over your favourite snacks and drinks as you watch the big screen. Click here to see more photos of the cinema and to book Gili Lankanfushi. Scuba diving in the marine-filled waters by day is one thing, doing it at night is another. While you may have to put your brave face on, scuba diving at night brings with it a whole host of wonderful benefits. Firstly, many new species come out after nightfall. It’s also a whole other new experience navigating the underwater world with just a torch to illuminate your way. Frequently hailed as the spot for night diving, Alimatha impresses with its incredible array of marine-life that includes nursing sharks, turtles, rays, deals, and beautiful colorful tropical fish. Some people report spotting large tawny reef sharks that are up to 3 meters in length! The night dive spot is just off the Italian-inspired resort of Alimatha, but you don’t need to be staying there in order to dive. In fact, numerous other nearby resorts and liveaboard choose to anchor here at sunset to be a part of the action. Another highly-rated night dive is at Kuredu resort, which has its own network of underwater caves that are home to green sea turtles, blue corals, crabs, shrimps and leaf fish. Night dives really allow you to view the vivid colors of the marine life. If that wasn’t enough, there is also a shipwreck settled 18 meters below, which is a much-loved hangout spot for sleeping napoleon wrasse, parrotfish, and lobsters, plus this is known as a hotspot for bioluminescent plankton! Click here to see the latest deals at Kuredu resort. There are also a number of liveaboard diving boats which offer night dives as part of the vacation package. 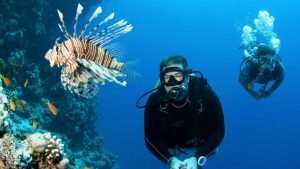 Check out this article for more information on scuba diving in the Maldives. When you think of the Maldives, you probably don’t think about dancing the night away. Yet, some of the resorts offer nightlife that would rival some of the best clubs in Europe (minus the enormous crowds). It’s quite the experience to stamp your feet in the soft sands under a starlit sky. Some resorts even bring in top-name DJs to spin out some bassy beats throughout the evening. It’s certainly a classier affair than a night out on the town, and the drink selection is top-notch. Yes, this incredible resort makes another appearance on our list, and for good reason. It has one of the best nightlife out of all 110+ resorts in the Maldives. They truly go above and beyond to provide memorable nights out for guests of all ages, and with all music tastes. Special themed nights, intentional DJs and talented acrobatic performers are regular here. 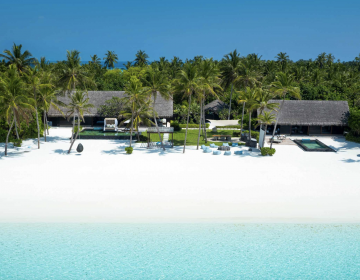 Click here to book the One & Only Reethi Rah. This bar and club really has to be seen to be believed, as it’s located some 6 meters underwater. The glass enclosure allows you to marvel at turtles, eels, and rainbow-coloured fish as you sip on freshly-muddled cocktails and fine wines from around the world. They often hold live music nights, and themed events that go well into the early hours. Perhaps one of the most famous and long-running nights out is at Kurumba on the North Male Atoll. A firm favorite with tourists and locals alike, this mega-club is open (and often packed) 7 days of the week. Every night there is something different going on from local DJs to the Maldivian dance night Boduberu, jazz, and special events. Drinks are a lot more affordable in comparison to those on fancy resorts, and the open-air beach vibe creates a magical atmosphere for a night out with a difference. With 90% of the Maldives being water and that water filled with one of the largest selection of marine life in the world, night fishing can be an incredible experience here. There are a number of laws and regulations in place to protect the area from overfishing, so in order to adhere to these rules, you will need to go with a qualified guide who advise you on the best practices. 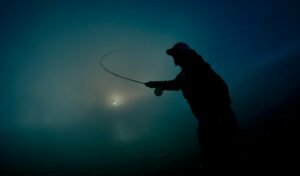 Most resorts will offer night fishing packages (either group or private), that come with all the equipment you need to reel in those fish. Some resorts that offer night fishing excursions include Maafushi Island Cottage Maldives and Coco Cottage Maldives. We have a fishing in the Maldives guide which offers more info on fishing trips. Last but certainly not least is star-gazing. Yes, the stars shine so incredibly bright here that you can easily spend a few hours laying on the sands and taking them all in. Take out a blanket and a few snacks, or perhaps a glass of tipple and simply look up at hem with your loved one. The lack of air pollution transforms a dark sky into one that glitters with the light of a thousand stars. A top tip is to download the Skyview App. When you point your phone at the stars, this clever app will be able to tell you the names of all the constellations. 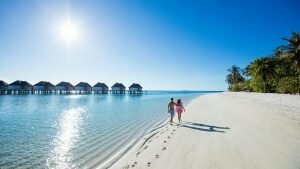 Looking for more information on the Maldives? Our ultimate Maldives vacation guide will help you out. These are just a few of the top things that you can do in the Maldives at night. Of course, the amazing things about these islands is that you can do nothing at all and still have an incredible time. Just a simple nighttime stroll, or snuggling up with a loved one to watch a film is all you need. The Maldives are amazing any time of day or night. Enjoy!